Forty persons were killed and over 70 injured today in a suicide bomb attack in a moving Moscow Metro train during the morning rush hour, officials said. An injured person is led by a rescue worker from the Avtozovodskaya metro station in Moscow after an explosion on a commuter train on Friday. Irked by media reports linking the army to nuclear proliferation, Pakistan President Pervez Musharraf has turned the heat on former army chiefs and local media, saying that their speeches and write-ups harmed the country. A motion was filed to a Pakistani court today against the “detention” of the country’s top nuclear scientist, Dr Abdul Qadeer Khan, who was pardoned after he admitted his involvement in the export of nuclear technology. 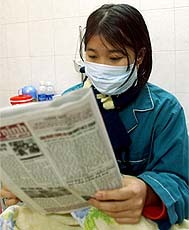 Two more persons died in Vietnam due to bird flu, pushing up the toll in the country to 13, officials said today. A six-year-old girl from southern Dong Nai province, who died on Tuesday, tested positive for the H5N1 strain of bird flu, said Phan Van Tu of the Ho Chi Minh City Pasteur Institute. A 24-year-old man from central Lam Dong province, who died on Monday, was also confirmed as a bird flu victim. After years of discord, Indian ghazal maestro Jagjit Singh will arrive in Pakistan tomorrow to sing songs of harmony and brotherhood. The ghazal king has been advocating reciprocal visits for artistes of the two countries and vociferously opposed the promotion of Pakistani singers in India on the ground that artistes from his country were earlier not allowed to perform in Pakistan. Indian doctors bring relief and hope to Bam quake survivors. According to the Emergency Situations and Disaster Management Department, the blast took place at 8.40 am (10.10 am) IST in the second coach of the train going from Paveltskaya station in the centre of the city to Avtozavodskaya. 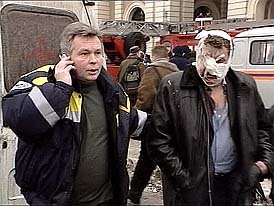 Forty persons have died and more than 70 injured in the blast, Moscow Ambulance Service officials said. Earlier, Russian Deputy Interior Minister Alexander Chekalin had put the death toll at 30. Fifteen persons have been hospitalised with serious injuries, the police said adding more than 50 passengers have been discharged from hospital after first aid. Police spokesman Kiril Mazurim said the blast was the result of a suicide bomb attack. However, he said it was difficult at the moment to ascertain whether the bomber was a male or a female. Forensic and explosive experts are investigating the blast, he said. About 700 passengers have been evacuated during the massive rescue operation, ITAR-TASS reported. Irked by media reports linking the army to nuclear proliferation, Pakistan President Pervez Musharraf has turned the heat on former army chiefs and local media, saying that their speeches and write-ups harmed the country. He has asked them to refrain from doing so in national interest. “These people want to come in limelight so that people realise their importance. But they say baseless things,” a stern looking Musharraf said at a briefing of editors here. Reading out the headlines in local newspapers, he said persistent write-ups accusing the army of involvement in proliferation did a dis-service to Pakistan. 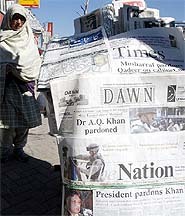 The President said the media should not write about it in national interest even if such allegations were true. “Stop writing this. You do not know what would be result of this reckless implication of every institution in the proliferation issue,” he asserted. “The UN Security Council will immediately impose sanctions against us, next we will be asked to sign the NPT (Non-Proliferation Treaty) and the CTBT (Comprehensive Test Ban Treaty); then we will be declared a rogue state and finally our vital interests would come under imminent physical danger,” he warned last night. Ehsamul Haq, brother of Dr Khan’s ex-Principal Secretary, filed a habeas corpus petition today in the country’s Lahore High Court, demanding the scientist should not be handed over to any other country. Islamul Haq, is among the six detained scientists and officials from Kahutta Research Laboratories (KRL). Concerned over Pakistani scientists providing nuclear technology to Iran, North Korea and Libya, Democratic Congressman Frank Pallone has called for US and international monitoring of Pakistan’s nuclear programme. Two more persons died in Vietnam due to bird flu, pushing up the toll in the country to 13, officials said today. A six-year-old girl from southern Dong Nai province, who died on Tuesday, tested positive for the H5N1 strain of bird flu, said Phan Van Tu of the Ho Chi Minh City Pasteur Institute. A 24-year-old man from central Lam Dong province, who died on Monday, was also confirmed as a bird flu victim. Meanwhile, a deadly strain of bird flu has been detected in initial tests of several Vietnamese pigs, the Food and Agriculture Organisation said on Friday. However, a Vietnamese government official said they were unaware of any such finding. “The H5N1 virus was in the nasal cavities of the pigs,” said Anton Rychener, Vietnam representative of the UN agency. He added that blood samples of pigs had been sent to Hong Kong and results were not yet returned. The pigs had not fallen ill with the virus that has killed at least 18 humans. The finding is alarming because pigs can become a “mixing vessel” for the flu virus. The World Health Organisation has said this can result in the emergence of a new subtype of virus for which humans have no immunity. After years of discord, Indian ghazal maestro Jagjit Singh will arrive in Pakistan tomorrow to sing songs of harmony and brotherhood. The ghazal king has been advocating reciprocal visits for artistes of the two countries and vociferously opposed the promotion of Pakistani singers in India on the ground that artistes from his country were earlier not allowed to perform in Pakistan. Jagjit Singh will arrive in Karachi tomorrow and is likely to perform at a music concert, The Daily Times reported today. A host of Indian artistes, including Shekhar Suman, Parikshit Sahni and Sunidhi Chauhan, will perform in Lahore during the Basant festivities.